The Vitamix 5200 is a great option that exists somewhere between Vitamix’s e310 and the 5300. It's capable of making a number of different things including baby food, nut butters and even soups. With all that capability, it is able to replace many other kinds of tools out there. The price it comes at is also a little bit lower than other available options. Check out these blender reviews which outline some of the best for smoothies. While it may not be the most gorgeous device, it's simple and pleasing. Controls are clear, practical and functional. Simple and easy to use, buttons and dials are clearly marked. While no product is perfect, many customers find it to be long-lasting. There's a lot to appreciate about the Vitamix 5200, including the ability to make just about anything. Due to the versatility, it can also save you a lot of space by doing the job of many appliances in one. You'll be able to make frozen yogurt, soup, smoothies and a wide variety of other things. In addition, the 64-ounce container will hold a lot, so you have enough to share. This is perfect for larger families, or for those who like to make a lot of something and freeze it for later. The blades are also made from stainless steel, ensuring they won't falter. While it may be able to heat your food, the motor is designed to stay cool, so you won't need to worry too much about it overheating. This heating ability is wonderful because it allows you to make things like soup without needing a pot or stove as well. For those who like to bake, you'll even be able to mix up dough or batter for various baked goods with this small appliance. That means you likely won't need a mixer for most things. Even thicker ingredients used to make pizza dough are easily tamed with this blender. Largely, this blender is for those who really enjoy cooking from scratch, and who want one simple tool that can do it all. Instead of buying baby foods, soups or frozen desserts, you'll be able to make them in a matter of minutes using this convenient blender. It's also an ideal option for those who may not have a lot of space to offer up to many appliances. It's able to do the jobs of many other things, so you'll just need room for the one blender. On top of that, the things you can make with it are likely to be healthier than store-bought options. Do keep in mind that this blender is an expensive one, so it's not likely to be the best choice for a casual blender user. Instead, it's for those who want something that can handle a lot, and often. This is a device that can take everything you throw at it and then some. When you make the purchase, you'll of course get the 64-ounce container and motor base, which will provide what you need to get going. You'll also receive a DVD as well as a guide for getting started with using the blender and perhaps learning some of the recipes you can make. Finally, you'll get a classic tamper. This helps with making sure things are placed in the container as you want them, making it easier to create perfect results. To finish it all off, the 7-year warranty can ensure your investment is protected. With the Vitamix 5200, you'll also be able to select a color that works best for your home. There are platinum, black, white, brushed stainless and red models. As a result, the one you choose will surely fit into your kitchen without becoming an eyesore. You'll easily be able to control the speed with this device, allowing you to create all the textures you want thanks to the dial in the center. On top of that, you'll be able to use the pulse button to create complete control. On top of all of that, one fantastic feature of the Vitamix blenders is the self-cleaning function. With some hot water and a little bit of dish soap, the machine will be able to get itself clean in a matter of seconds. Consequently, the process of getting the blender cleaned is much simpler than with many other models. 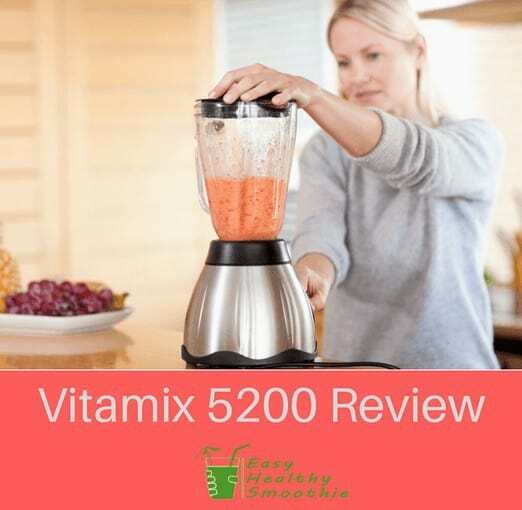 While the Vitamix 5200 is one of the more expensive options out there, it's one that can help you to replace a number of other devices out there. As a result, it's able to save you space as well as money over purchasing a bunch of other tools needed for chopping, heating, etc. With everything this device can help you to make, it's going to be a highly useful device in your household. Whether it's ice cream, smoothies or soups you need to make, this is one blender that will be able to handle it all. Fun facts: When was the blender invented?